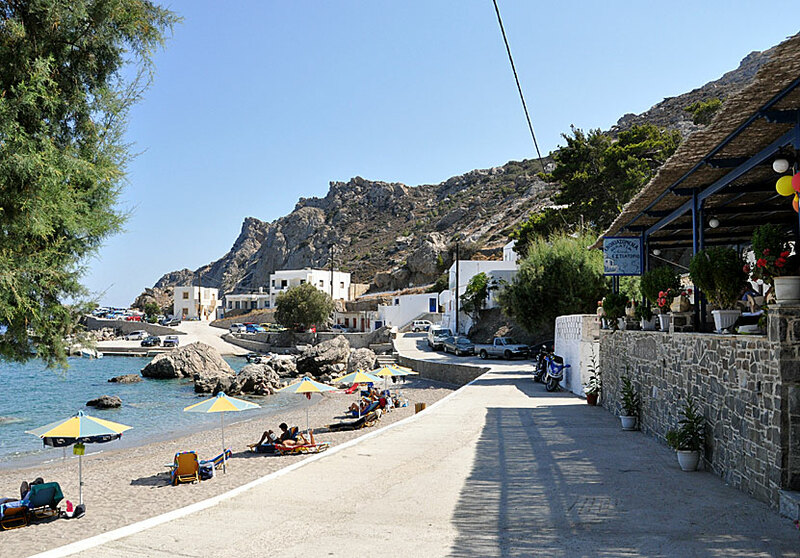 Spoa and Agios Nikolaos beach in Karpathos. Spoa lies about 8 kilometres east of Mesochori and around 20 kilometres north of Pigadia. Some old windmills stands just before the road turns into Spoa. The construction is common on Karpathos, but uncommon on other islands. The windmills are flat on one side and rounded on the other. You have covered half the island when you reach the village of Spoa, the villages of Diafani, Olympos and Avlona lies on the second inaccessible mountainous half. The road to Olympos begins just before Spoa. One wonders what will happen now that the road to Olympos is widened and paved. Probably the traffic will if not be intense, but at least quite lively. 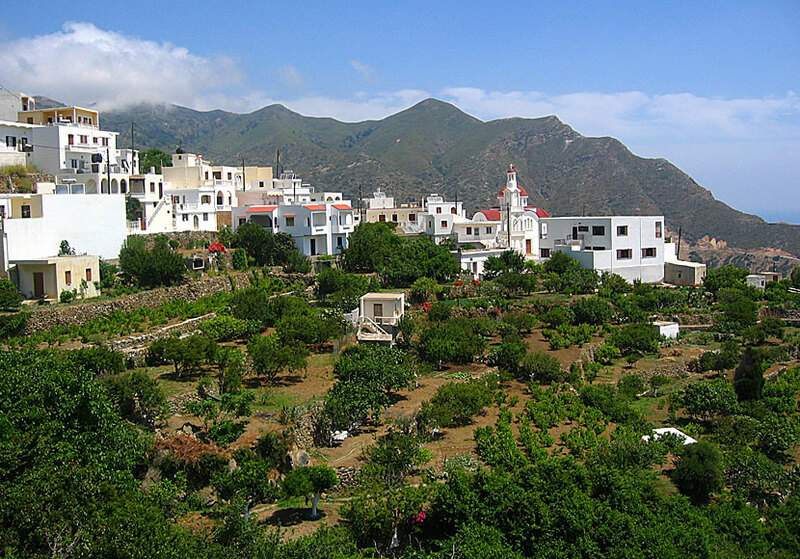 The village lies dramatically beautiful in a valley with fruit trees, flowers and vineyards. The village is free of cars so you have to park your motor vehicle at the beginning of the village, where there is a café and a taverna. Agios Nikolaos is a small cosy village only about 5 kilometres below Spoa and is well worth a visit. The road down to the sea is tortuous and offers stunning sea views. There are two pretty nice pebble beaches and one cosy taverna with restful views overlooking the sea in Agios Nikolaos. The surroundings are beautiful and the water offer excellent snorkelling opportunities. The beach in Agios Nikolaos below Spoa. 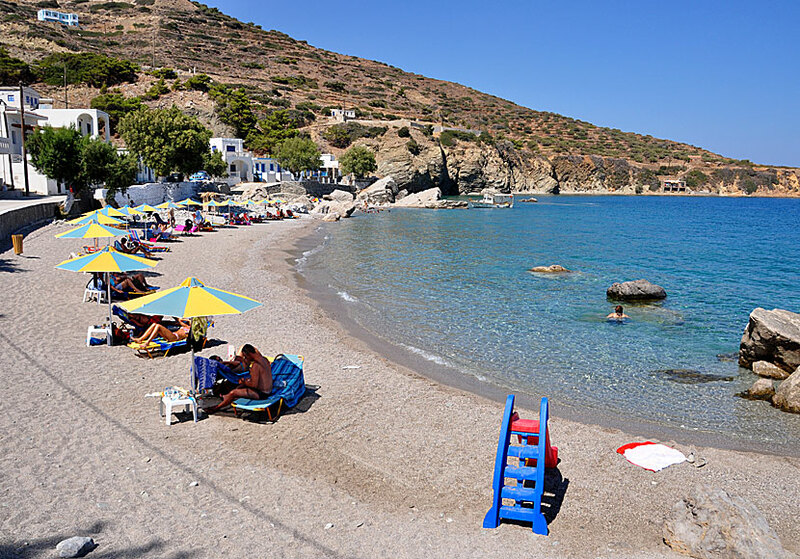 Note that there is one more beach on Karpathos named Agios Nikolaos, the other is located below Arkasa.